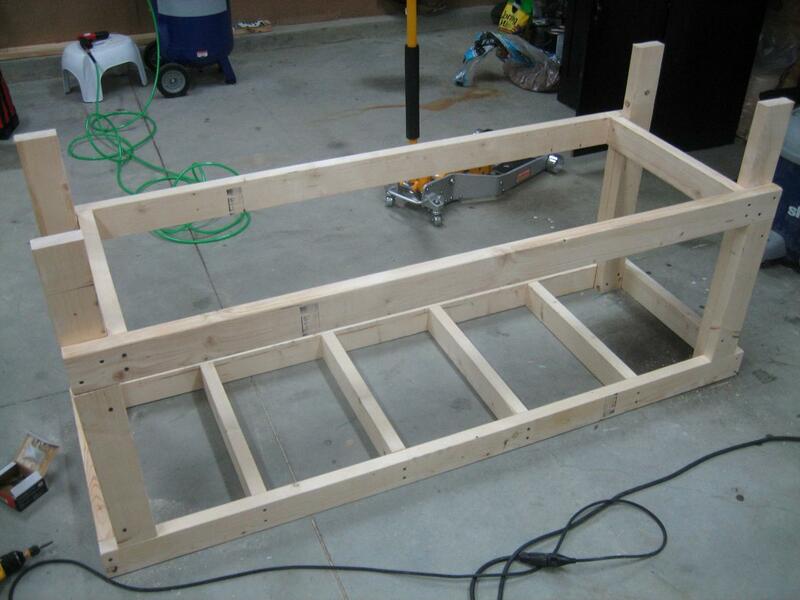 After some planning about space and layout in the garage, I decided to dive into the construction of a workbench. 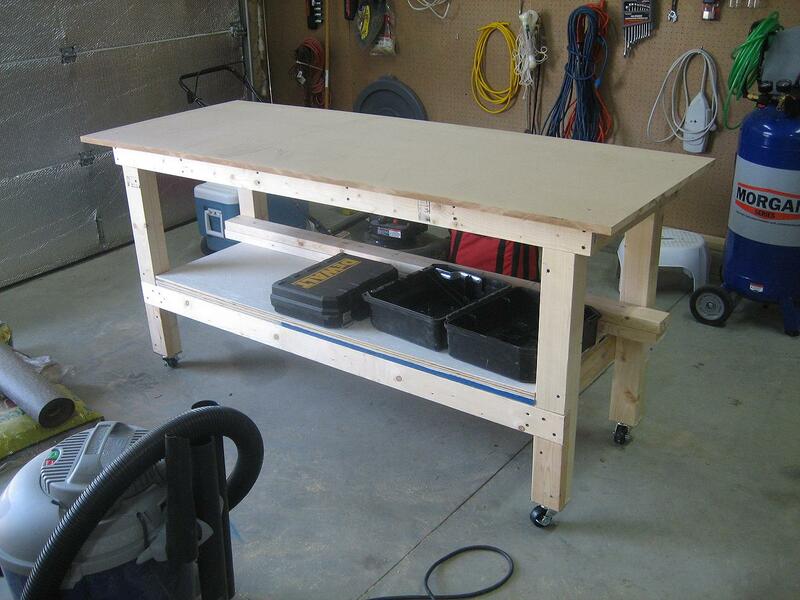 I’ve heard (and seen on some builder’s sites) some of the EAA 1000 Workbenches, and I thought that would be a good first workbench. I’ll use that one for awhile before building a second one, hopefully with some improvements. Here’s a couple before pictures of my garage. I love the lighting. There was a single incandescent bulb in the gargage before. Also, I lined the garage doors with some double sided bubble foil I bought off eBay. I would say adding that decreased the temperature in my garage in the middle of the summer by 10 degrees. Good investment. 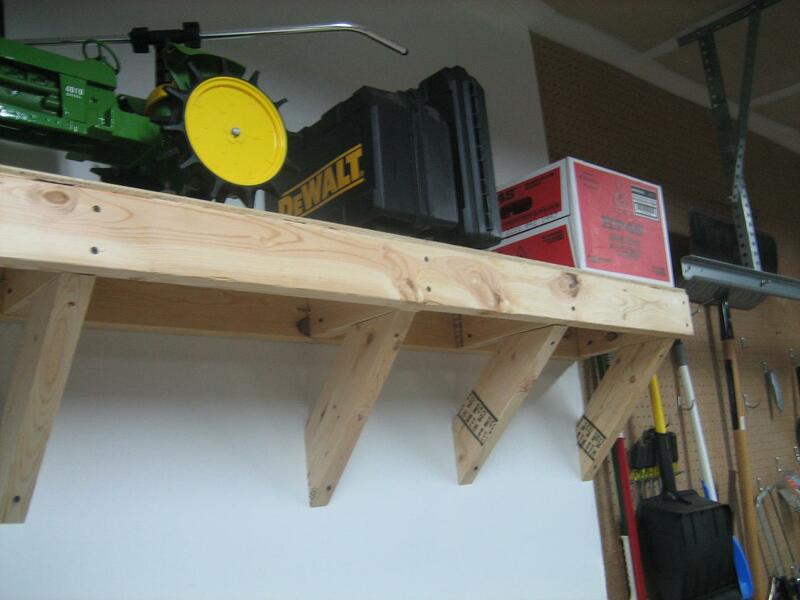 Then I built the lower shelf unit (using scrap wood for spacing). Is this where I say, “Ta Daaaa…”? 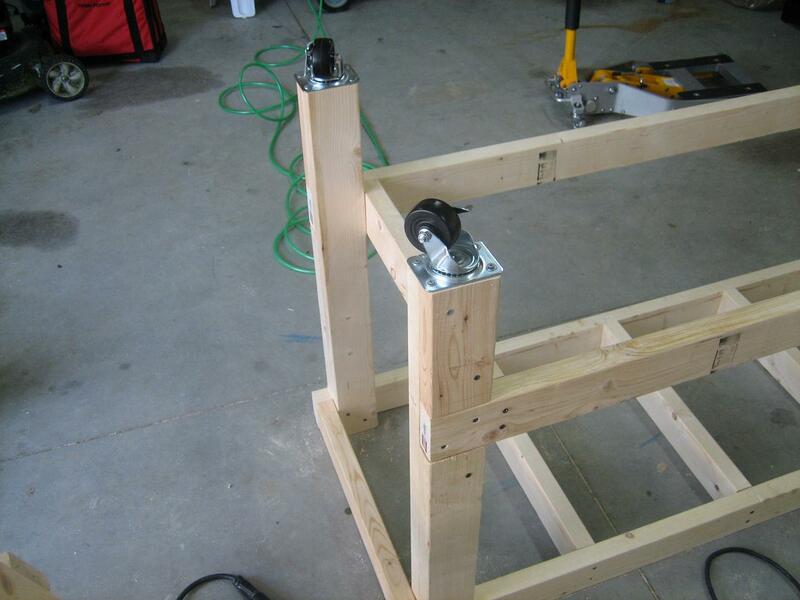 This entry was posted on Sunday, August 30th, 2009 at 1:13 pm and is filed under Builder's Log, Workshop. You can follow any responses to this entry through the RSS 2.0 feed. You can skip to the end and leave a response. Pinging is currently not allowed. 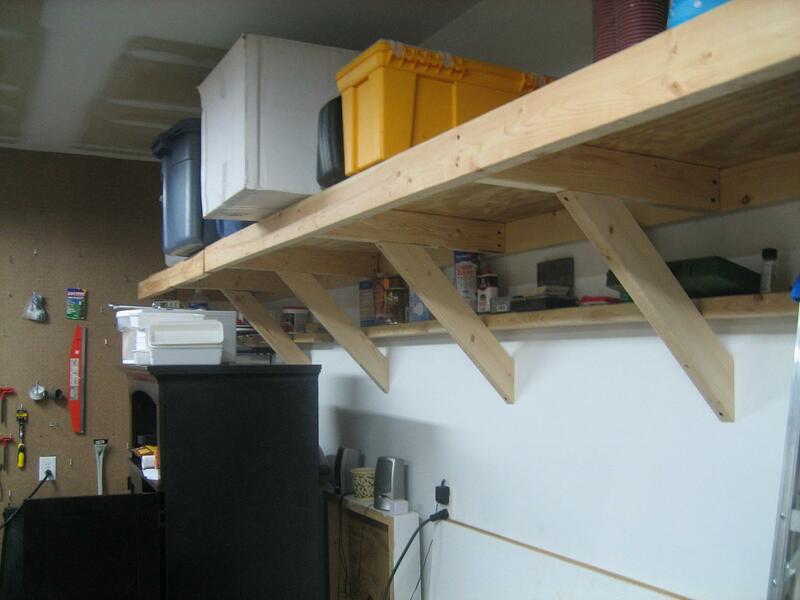 Did you use a set of plans for the wall shelves? 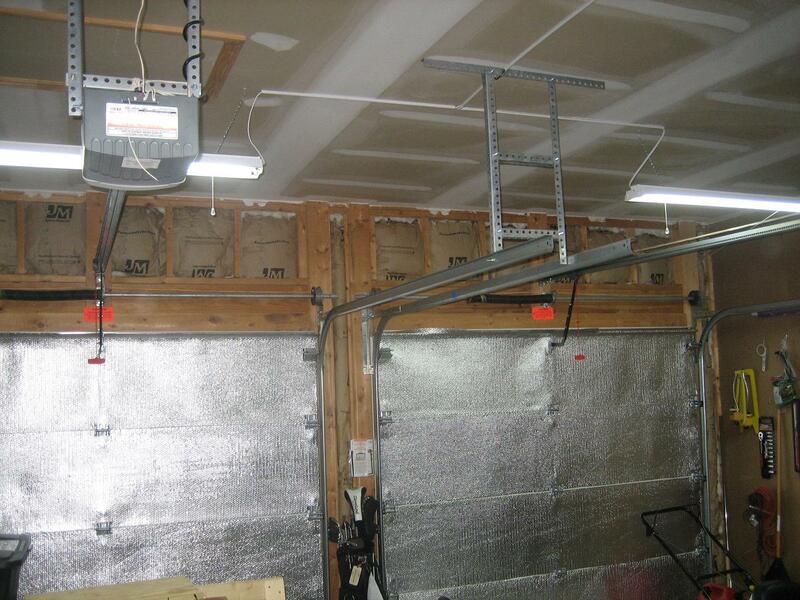 Where did you get the insulation for the garage doors? I didn’t use any plans for the shelves, but instead just winged it. 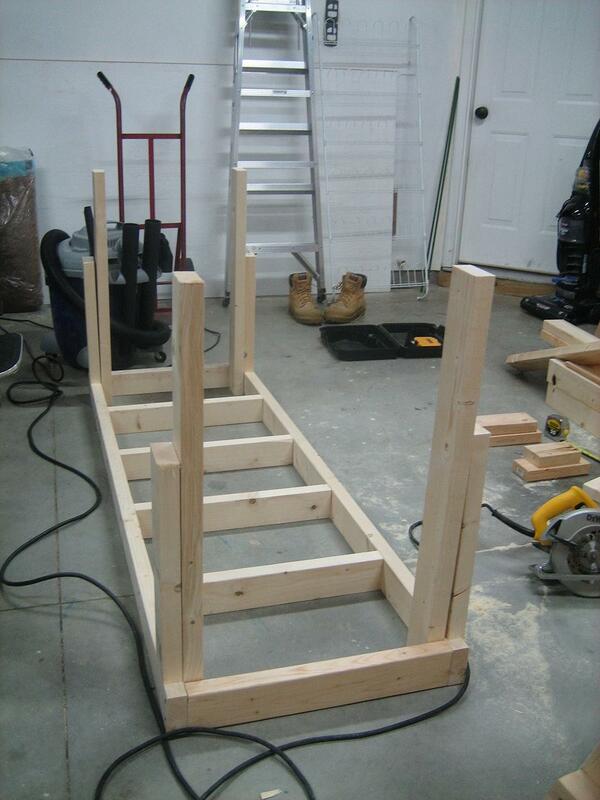 I didn’t know it at the time, but they are pretty much the top (first step) of the workbenches, with different dimensions. A buddy down the street has some like it, and I was able to hang off the edges of them, they were rock solid. The insulation for the garage was purchased from ebay after a search for “Garage Insulation.” They sell similar kits at Lowe’s and/or Home Depot for >$100…I think I got the ebay kit for $60 or so. Highly recommended…it really helps the temperature in the shop. Bench looks great! Thanks for the tip on the garage insulation. I’m going to try it. I also LOVE the John Deere tractor on picture #4. I have one that resembles it. Hi. 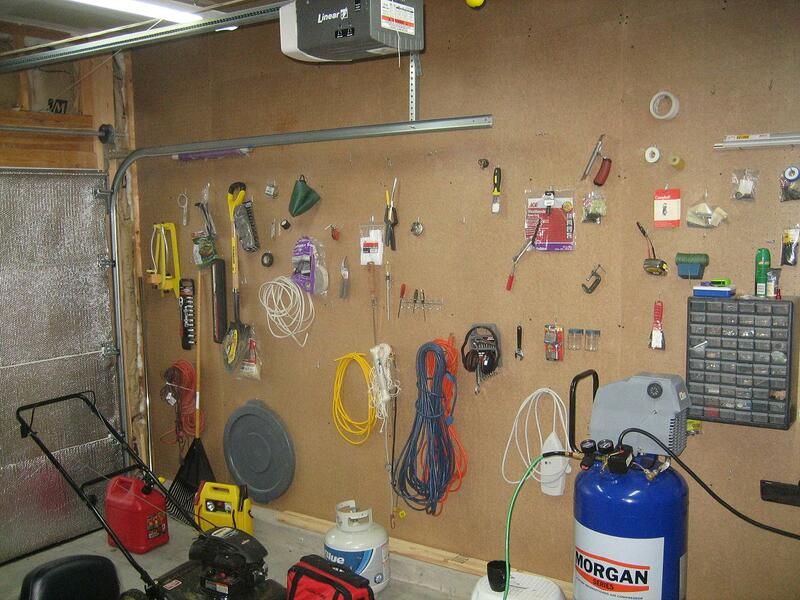 I have a new garage and want to do shelves like yours. How did you attach them to the finished wall? By the way, I love the idea of locking casters on the bench, mobility is nice. I ended up marking the studs using a studfinder through the drywall and then screwing (2 screws at each stud) a long 2×4 along the whole wall. 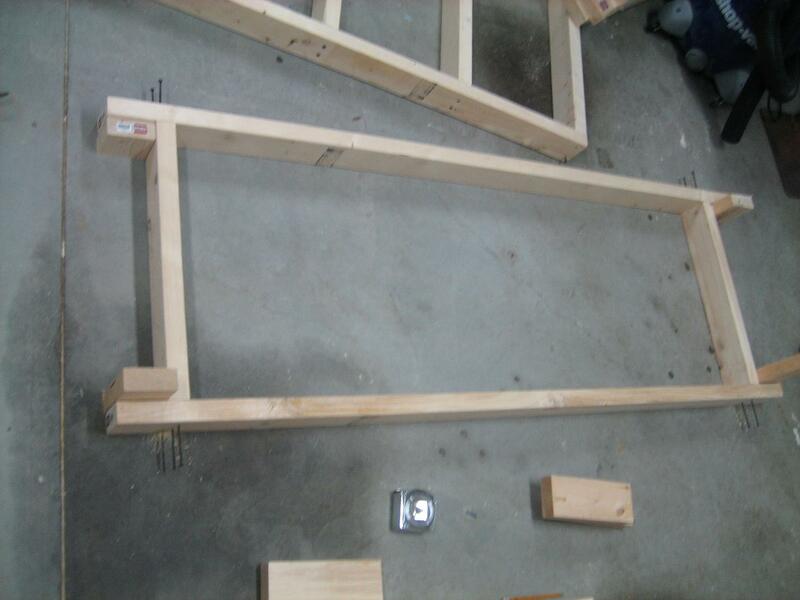 Then I screwed (diagonally) the cross members to that 2×4, and then installed the front 2×4 to the crossmembers. (The whole things was well supported by a few ladders here). Then I added the 45 degree pieces under each crossmember. All of the screws were 3″ coarse drywall screws, which work great. You can use woods screws, too. I’m 260, and I can hang from the edge of the shelf. Nice job. Looks good. Thanks for posting. 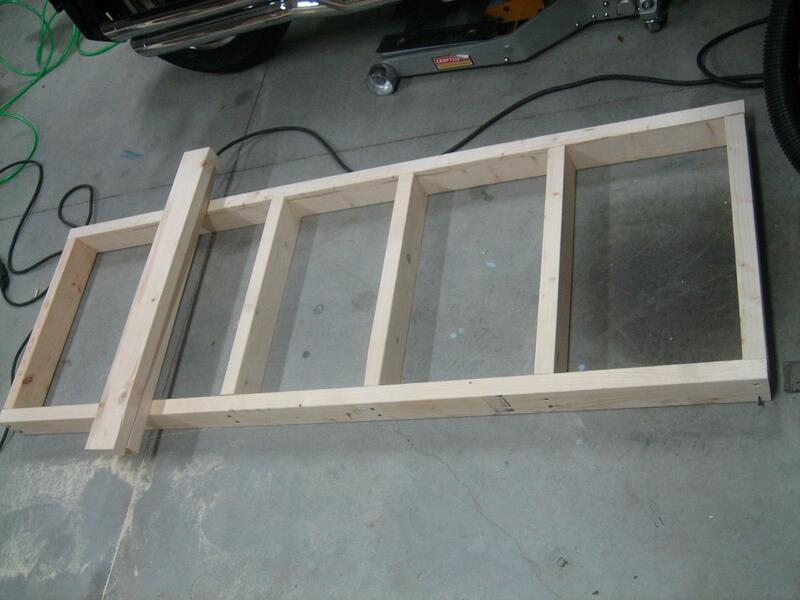 Andrew… found your site, just started my empennage kit. You’ve made me a fan of devinyling! I assume you are doing the priming only for the devinyled areas to save a bit of weight and not taking the vinyl off until closing up different sections? Yeah, the general idea was to not overprime. I figured that if I didn’t scratch or touch the alclad on non-mating surfaces, I didn’t need to prime. Of course, I’m putting in a glass cockpit, extra landing/taxi lights, extra nutplates for removable floors, etc. I’m probably not saving enough to make it worth the extra effort, but feel like it is a good compromise between no prime and full epoxy prime, and most importantly, I can sleep well at night with what I’ve done. Appreciate your approach and look forward to a continued dialogue as I move forward with this. I’m on the road a bunch and expect this will take more than 5 years. I started an RV-4 project, years ago, and was so intent on finishing it was a huge frustration. New perspective now, no hurry, and want to do it right. Interested in all you mentioned with the removable floor, extra lights and glass cockpit. I’ll read on. Let me know if you are ever in the DFW area so we can connect. I have most of my thoughts about systems and things on the design page if my site. I constructed that page as a collection of ideas from scrounging around the Internet and watching the forums. 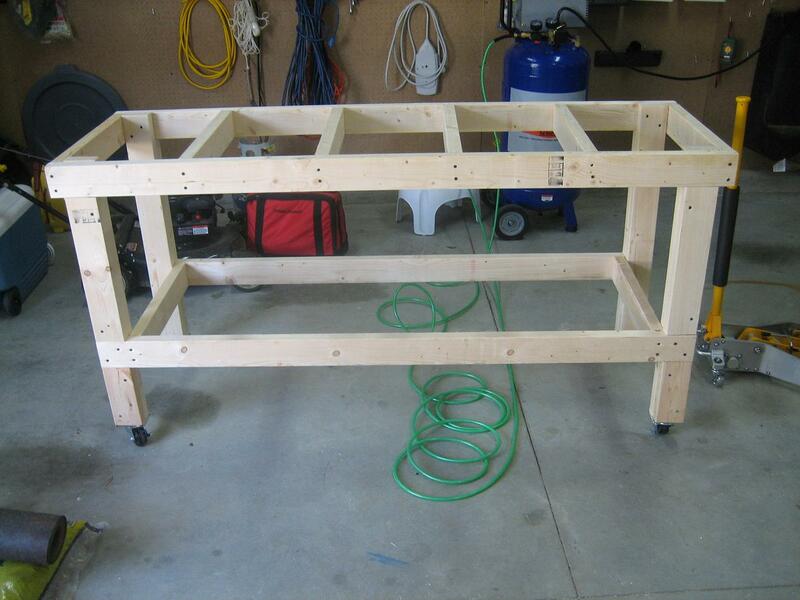 Hey I built two work tables using your design and your pictures. They came out great. Sturdy and level and solid. Thanks for putting this online so I could find it! Glad the pics could help. Good luck on the project. Keep me posted on your progress! I haven’t anything useful to add but wish to thank you for your efforts putting your experience on-line for all to read and view. You’ve re-invigorated my desire to build an RV-7 as recently I was leaning toward simply purchasing one(mainly because I’m a little impatient and want to fly it now). I will be reading on and looking forward to seeing the end result. Building is fun, and it’s a great hobby. Just make sure you are okay not having one to fly RIGHT NOW. Jeesh, looking back, I haven’t even worked on the airplane since the 13th. I need to get out into the garage tonight.